This afternoon for lunch I was in the mood for something light, not heavy. 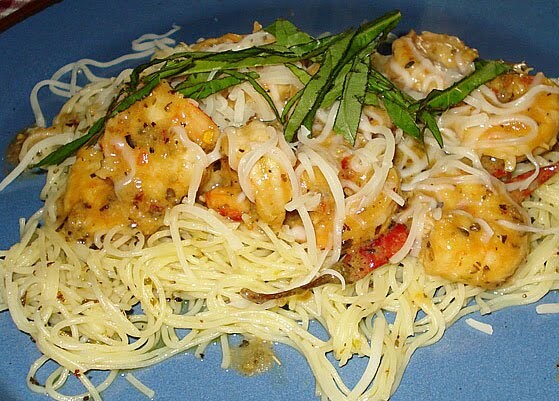 I decided to prepare teriyaki glazed shrimp on skewers along with a bed of tossed angel hair pasta in olive oil, fresh cut garlic and a bit of Tuscany seasoning. From time to time, you read about my Tuscany seasoning that I mention. Well, I’d tell you more, but the company has stopped making it…so it’s a bit hard to promote something that isn’t there. I am down to my last bit and still searching for a replacement! Damn you Costco! I’m pretty low on my white wines right now. Mostly I have a pick from Cabarnet’s, Merlot’s and a few other reds. I have my Cakebread Chardonnay but prefer to keep it chilled for those special intimate evenings. Today, I had a Fetzer Gewurztraminer 2008 chilling in the frig. I’ve always wondered with a name no one can pronounce, is it really a good wine? Or because of the hard pronounced name was a ploy for one to buy it, just because? I wonder if any 10 year old kid has had to spell it in the Spelling Bee competition. Especially when they ask, “Can you use it in a sentence?” At that point, the judge would be disqualified for not pronouncing it right or not knowing it was a name of a nice white wine. Lets get down to this particular wine. All I can say right now is, I am impressed! As soon as I popped the cork, poured the first glass you are welcomed by a beautifully aroma of fresh rose petals or honeysuckle. You have to take a look around to be sure someone didn’t walk in with flowers for you. The honeysuckle aroma blends well and not perfumey at all. Growing up, we had a big honeysuckle bush by the house and I was always out there, picking and licking. Those were the good ol’ days! As I was preparing the shrimp and pasta, this Gavurtz (simpler name) was right at home with what we were about to eat. From the first taste, it is very refreshing…reminding me of Spring time. The blends of apricot and peach were nicely balanced with the floral aroma. I wouldn’t call this a fruity wine at all. I usually save that for those sicky sweet wines I normally do not care for. If you like a nice Riesling, then you will enjoy a glass of Gewurztraminer by Fetzer from Germany. Pair this wine with a nice white fish, shrimp or even a grilled chicken. If the day is hot, this Fetzer is one I would keep chilled. I will keep a couple of bottles chilled at all times. It’s definitely a winner for those who love it light and refreshing. With Winter just around the corner and you’re stuck instead waiting for the snow to melt, wishing it was Spring…pour a glass of Gewurztraminer and you’ll think Spring was already here! High Recommended and Priced Right! Yum. I thought Gewurztraminers were mostly a dessert wine? It is a refreshing for either dessert or a nice light meal. I recommend pairing it with shrimp, pasta, tilapia and chicken.